Originating as a term in mathematics and computer science the concept of iteration has moved into design and learning. Iteration is at the heart of Challenge Based Learning (CBL). From identifying and refining big ideas and challenges to building and testing solutions, the investigation cycle repeats to improve the results. This challenge focuses on the process of iteration, combines it with CBL and directs it at improving an idea or process to make a positive impact on a community. Learning to refine actions to reach the desired result is an essential skill for the CBL process and life. Look around, talk with community members and identify something that can be improved. Ask questions, investigate, synthesize, prototype and iterate. What is the origin of the idea of iteration? What else is necessary for the iterative cycle? How can we use iteration to make ideas better? 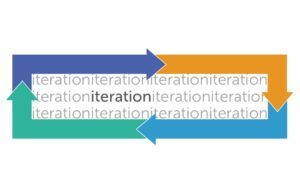 What is the role of reflection in an iterative process? What is the role of questions in an iterative process? What is the relationship between iteration and failure? What does iteration look like in sports, music and other activities? What are things that could work better in my school or community? Identify things that do not work well in your school and community.